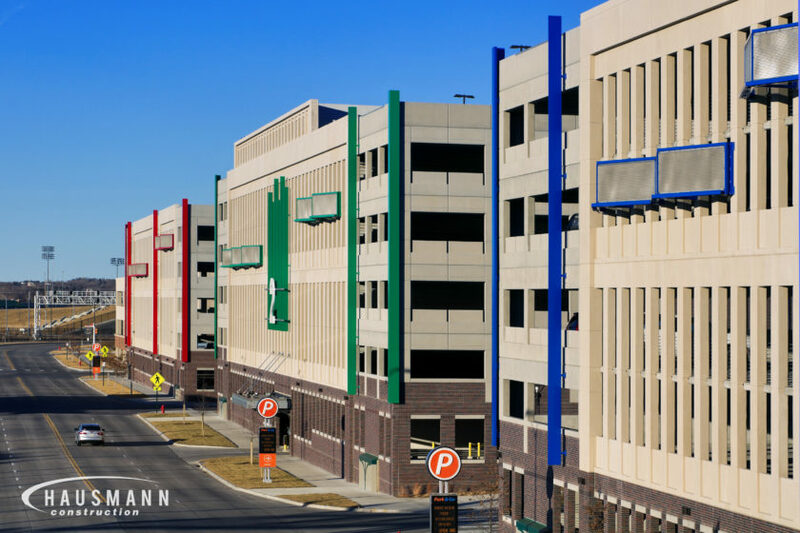 New construction of a parking garage and rental car facility at Omaha, Nebraska’s Eppley Airfield. 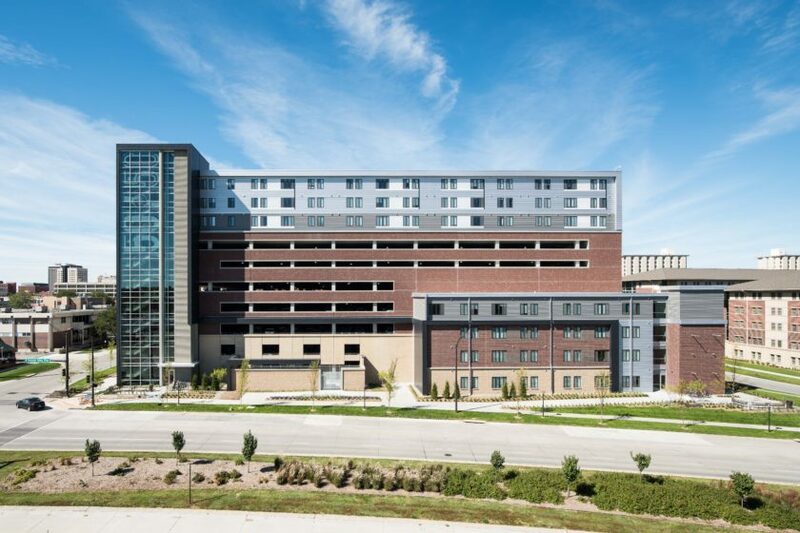 The parking garage will consist of 2,000 added spaces on four levels. 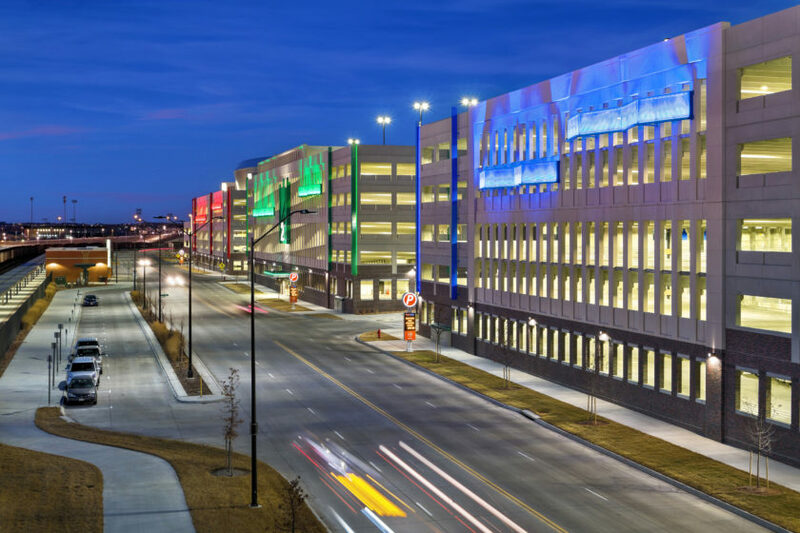 The structure is designed with energy efficient lighting, improved vehicular flow and direct access from the street. 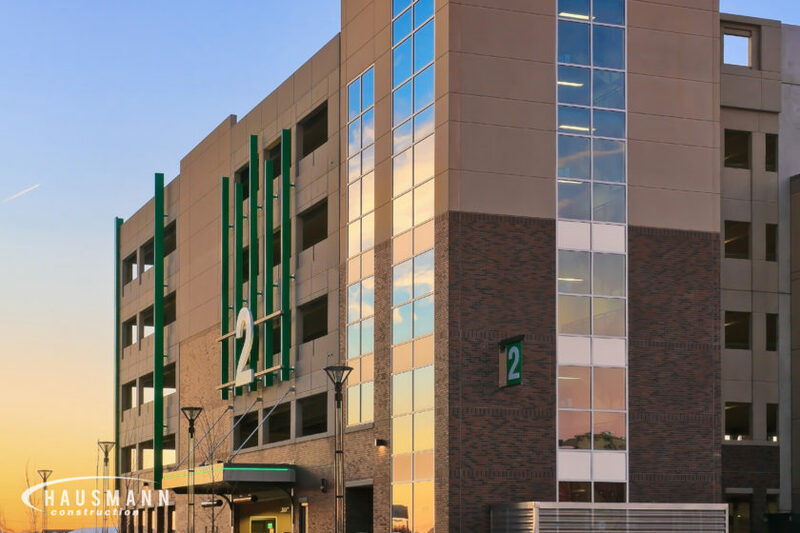 The rental car facility features a climate controlled walkway to customer service and just a short escalator ride to the rental cars will have you on your way in no time. 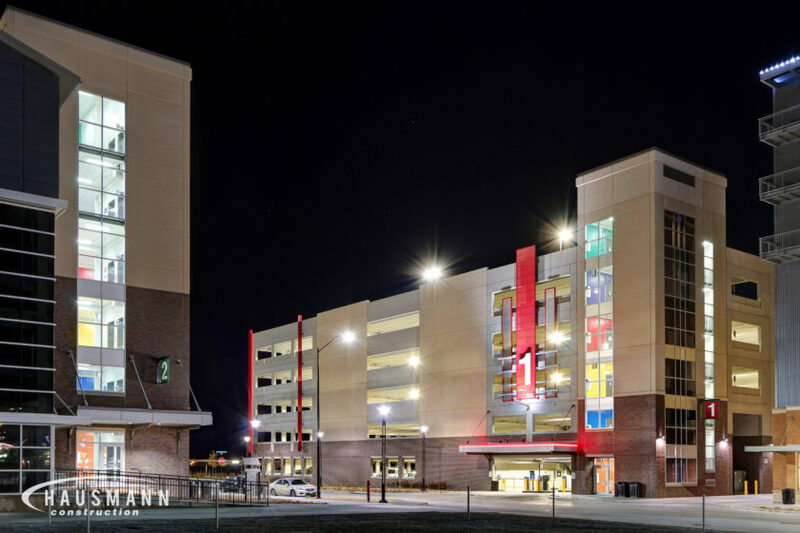 The Aspen Heights Parking Garage is located in the bustling downtown Lincoln, Nebraska area. 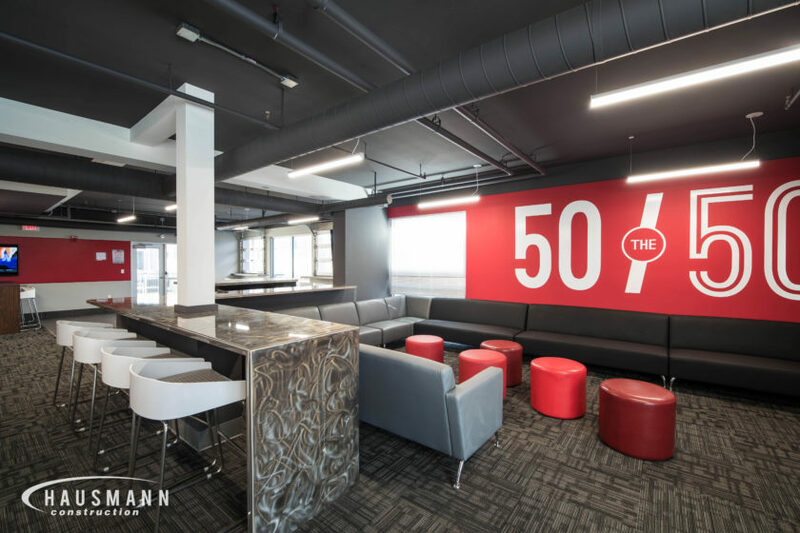 The footprint takes up a half square block. 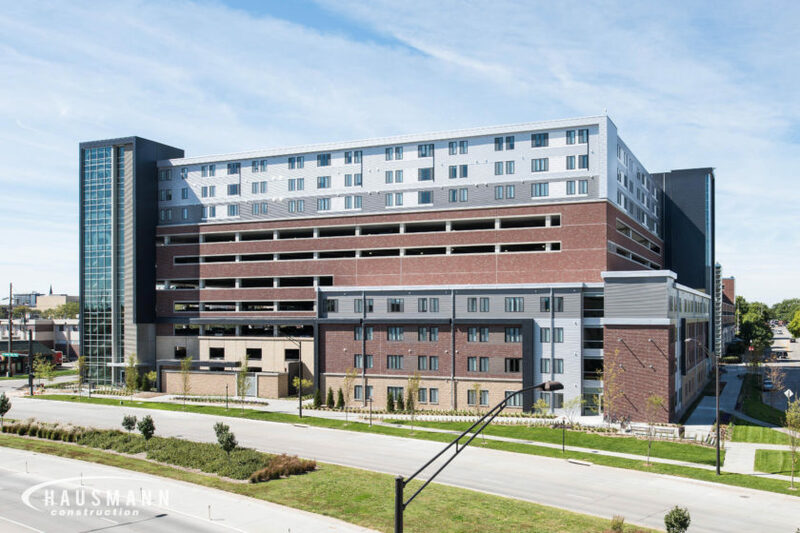 The 190,548 square foot, eight-story parking garage has 551 stalls for the student housing building located across the street. 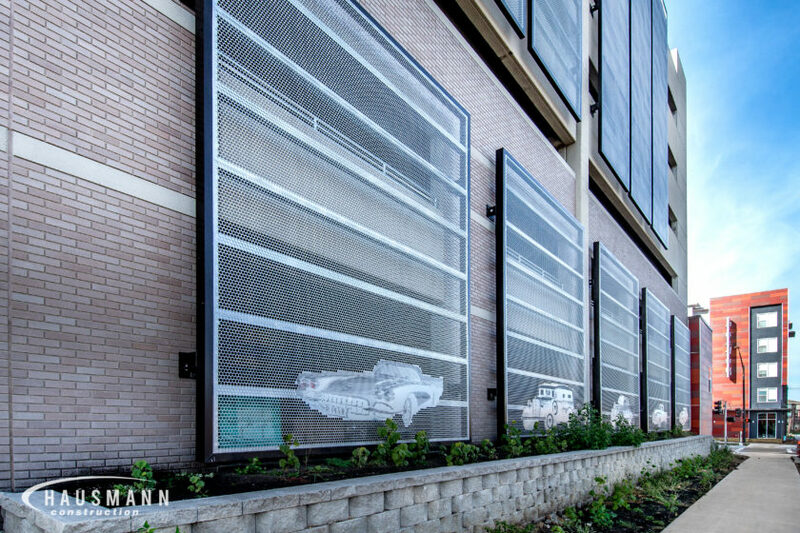 The garage has unique exterior metal screen panels with antique cars worked into the design and mape sunscreens. 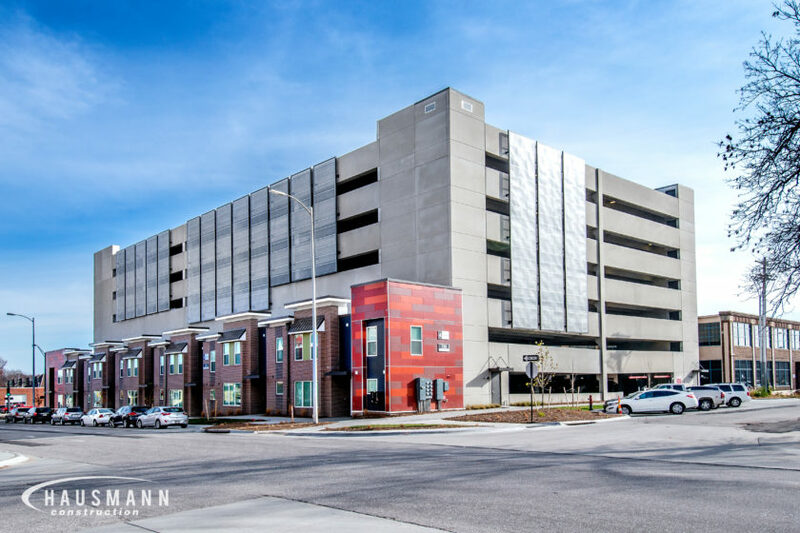 Seven, two-story townhomes, totaling 8,633 square feet made with Nichiha panels are attached to the garage. 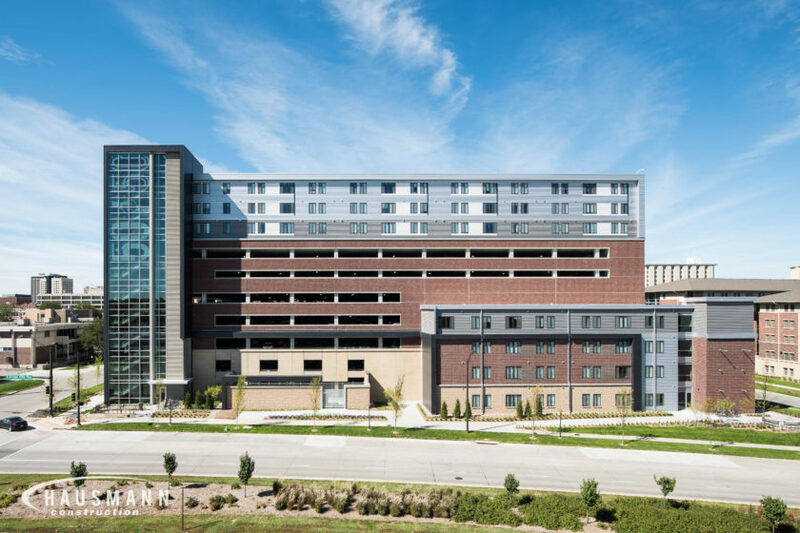 The Mixed-Use Parking and Residential Facility, located in Lincoln, Nebraska, includes a parking structure which accommodates 1,654 vehicles and management office space. 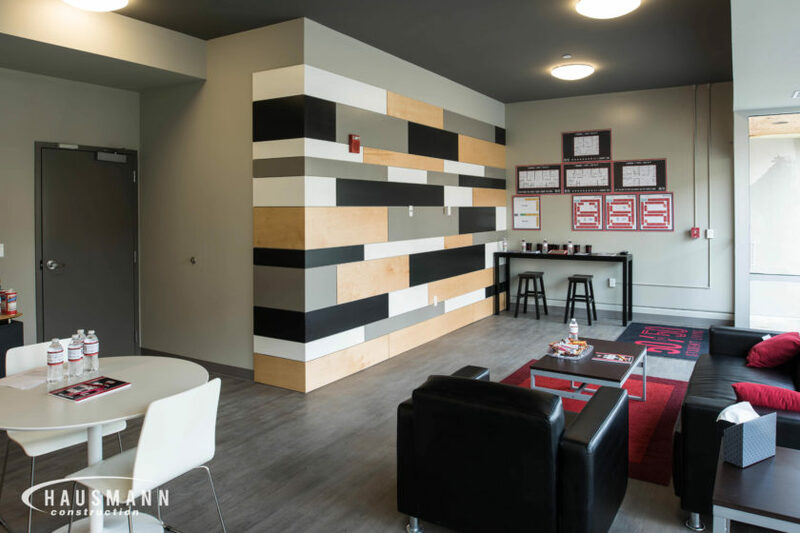 “The 50/50” housing facility includes 475 beds and was designed primarily for UNL students. 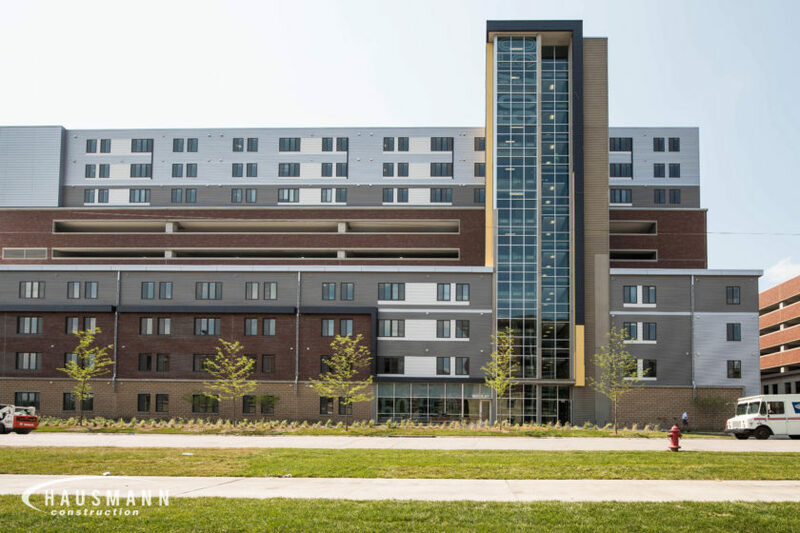 This structure consists of 130 suites of two-, three- and four-bedroom units. 26 suites (101 beds) are on first-fourth floors, with an additional 104 suites (374 beds) on top of the parking garage (floors nine to eleven). 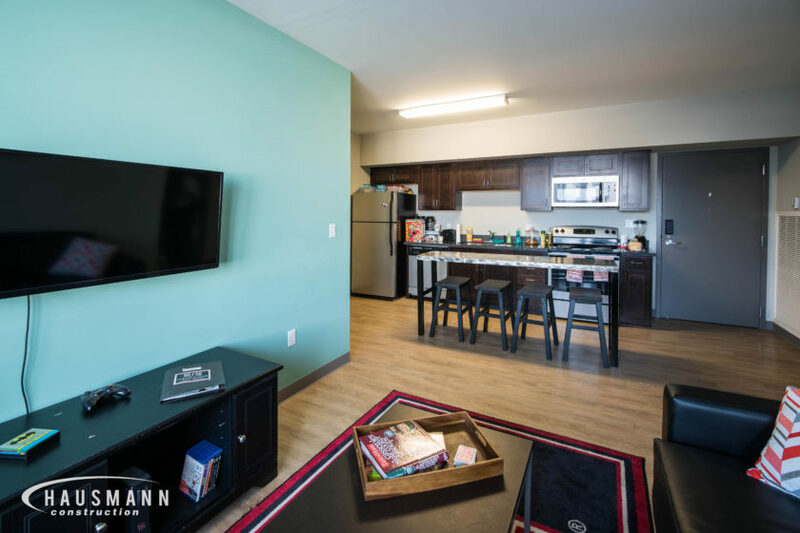 Apartment features and amenities include secured access, on-site management office, rooftop outdoor terrace with hot tubs, environmentally friendly roof garden with plantings, fitness center, group study lounges, bicycle storage, secured waiting areas for mass transit, full kitchens with appliances, fully furnished units, and washer/dryers. 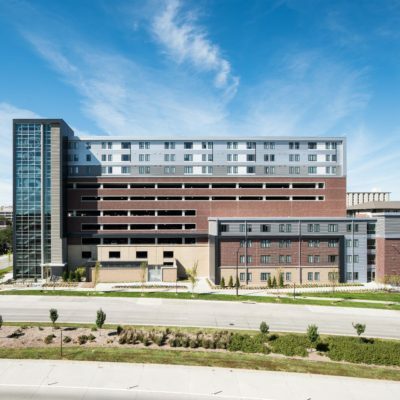 The seven-story parking structure has 1,608 stalls — 1,263 stalls for university parking and 345 stalls for the apartment complex. 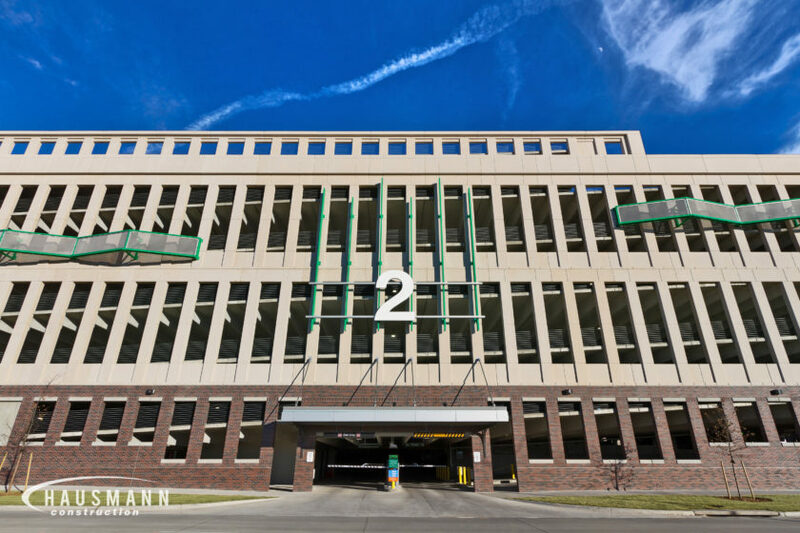 Parking Deck #2 is a two-bay double threaded helix with both bays being sloping ramps. 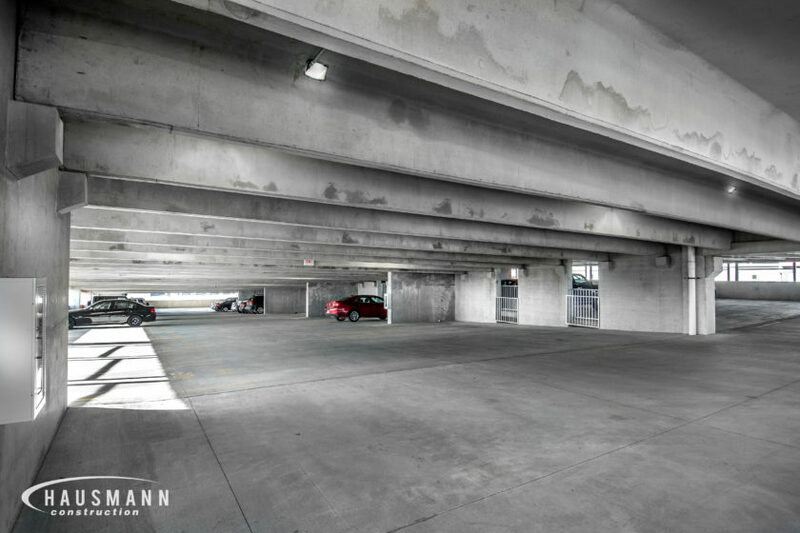 The garage design has a half-level below grade and six full levels above with two-way traffic. 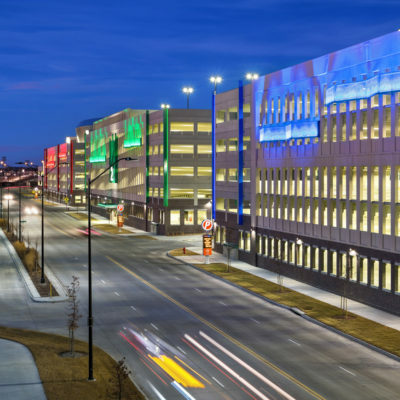 The roof level provides a cross-over connection between traffic circuits. 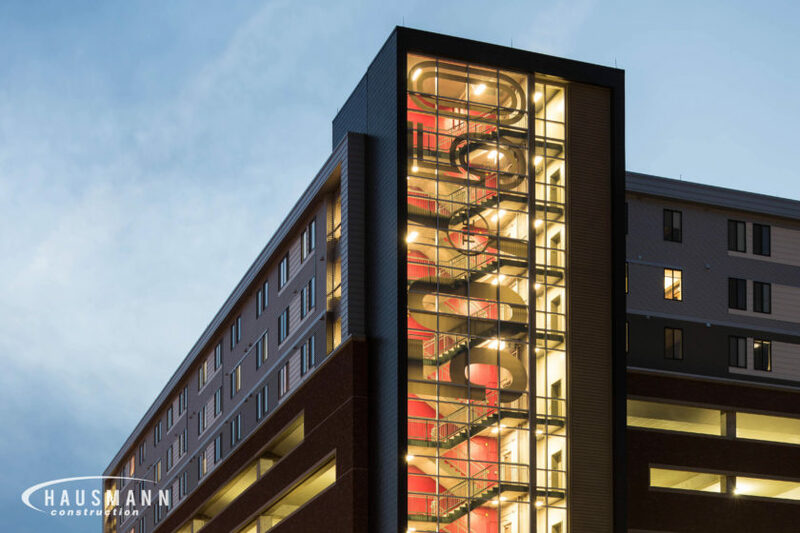 Stair and elevator towers wrap the DEC on the north and south ends. 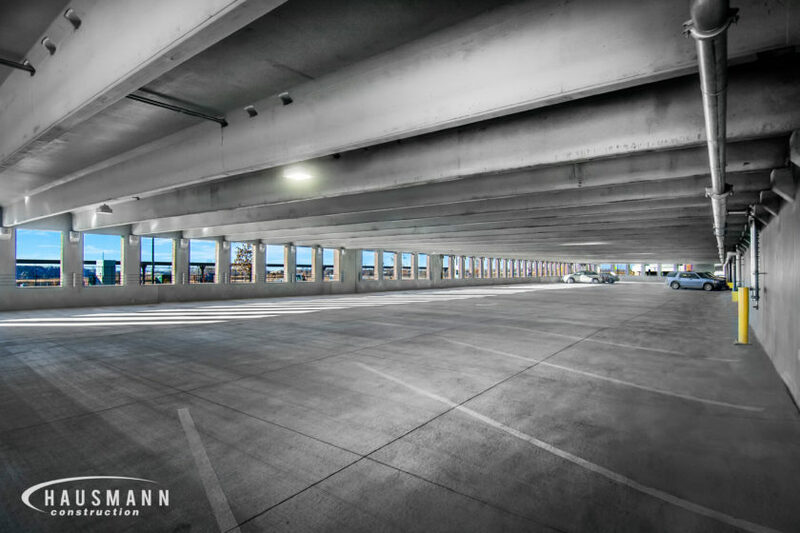 Total square footage for Deck #2 is 246,515 with 732 parking stalls. 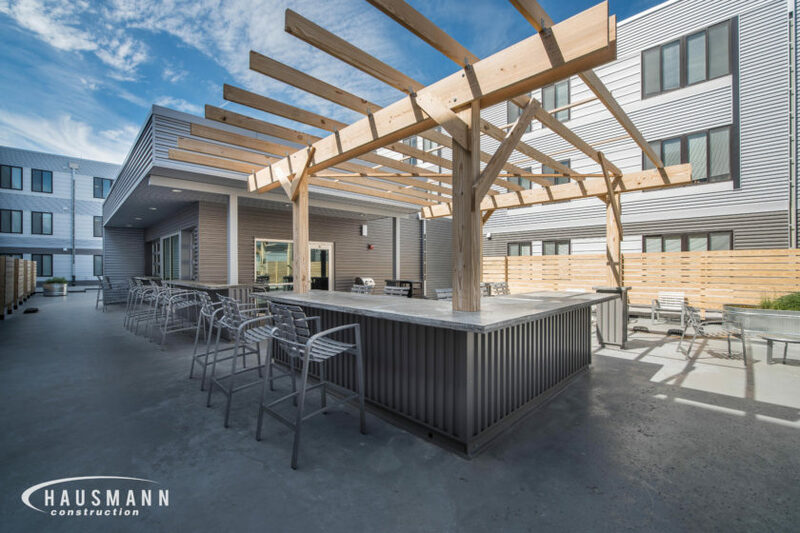 Deck #3 serves tenants of the Canopy and P Streets building east of the parking facility with a bridge linking the structures. 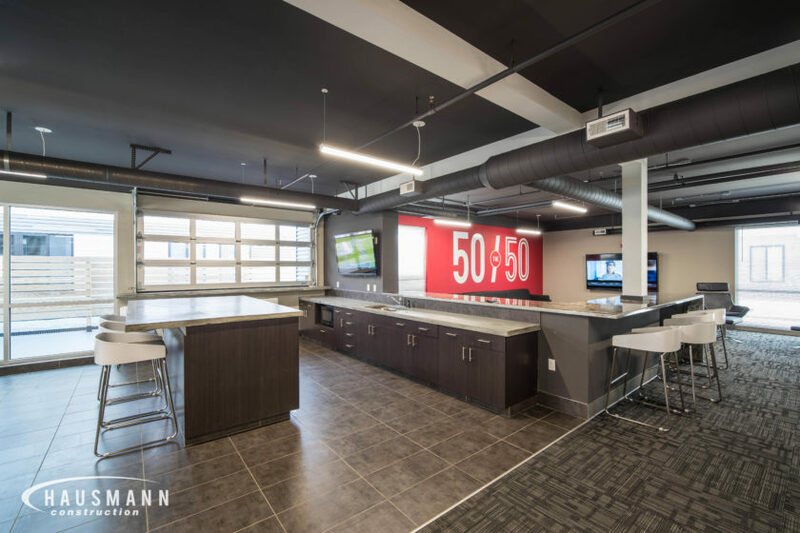 The garage serves event traffic for the Pinnacle Bank Arena in Lincoln, Nebraska. 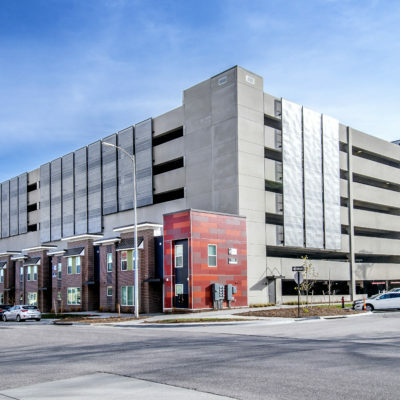 Similar to Parking Deck #1, the structure incorporates a double threaded helix circulation in a three-bay design, with two sloping ramps and one flat bay. 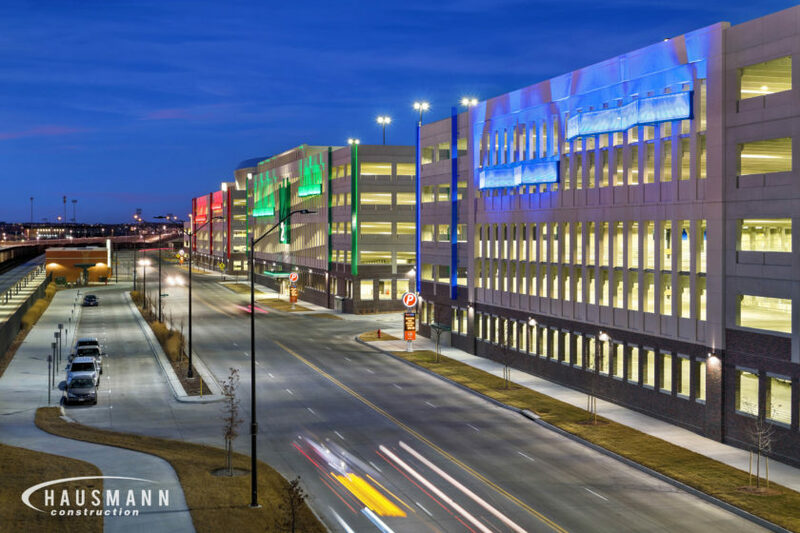 Vehicular access from the first level approaches north off of P Street and west off of Pinnacle Bank Arena Drive. 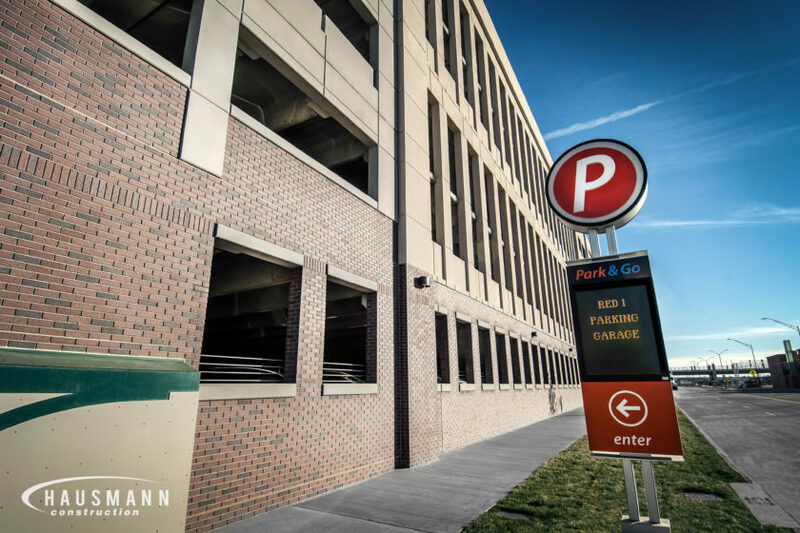 There are five full and a partial sixth floor of parking with 90-degree stalls and two-way traffic. 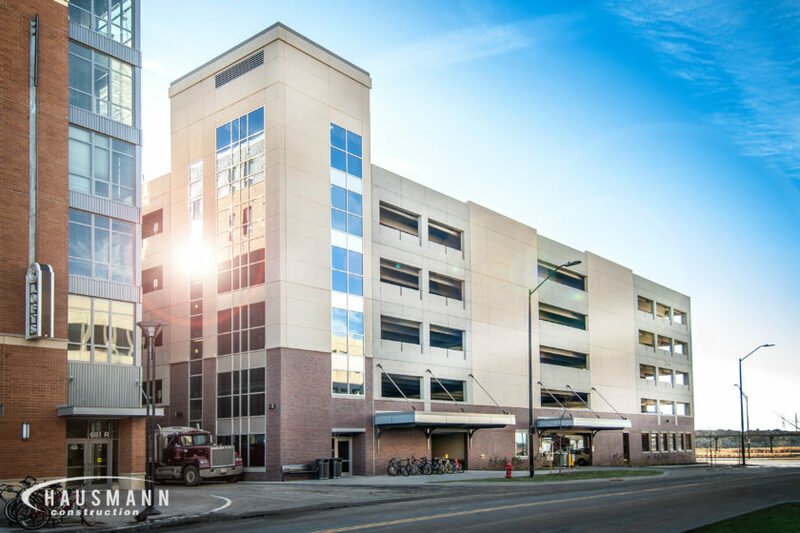 The first level, north end, includes space for a parking office, storage, trash holding and mechanical equipment. 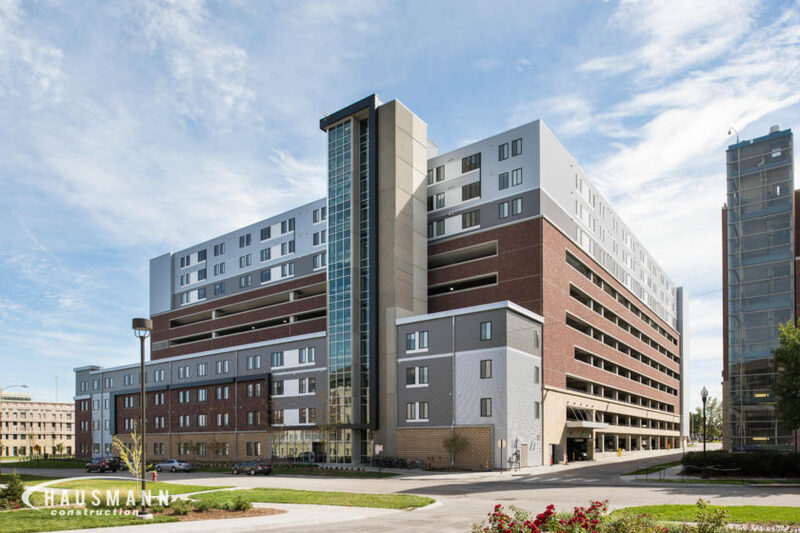 Stair/elevator towers are provided in the southeast and northeast corners of the structure, with sidewalk level connections to P and O streets. 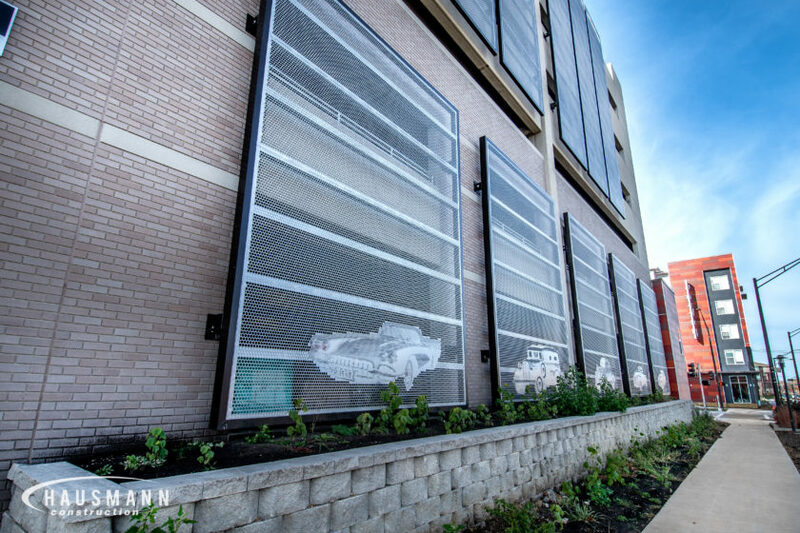 These feed to Canopy Street, which is a main pedestrian route to the Arena. 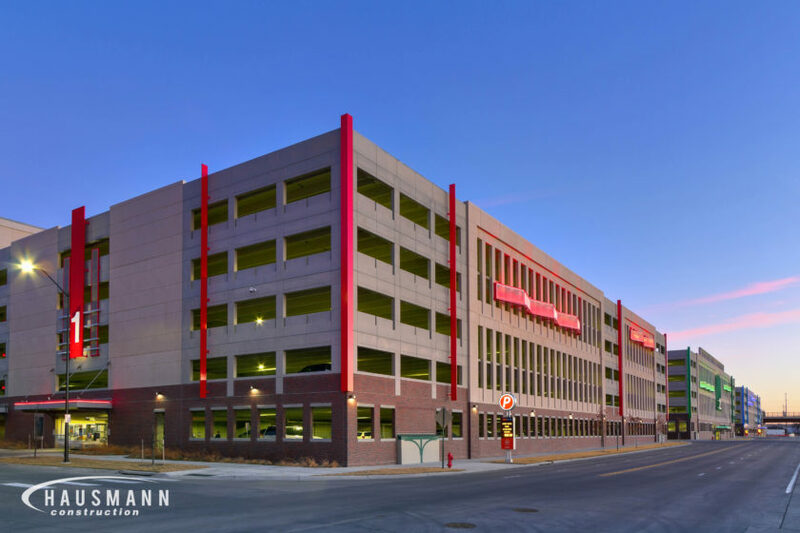 Deck #1 is designed to serve as an event garage adjacent to the Pinnacle Bank Arena in Lincoln, Nebraska. 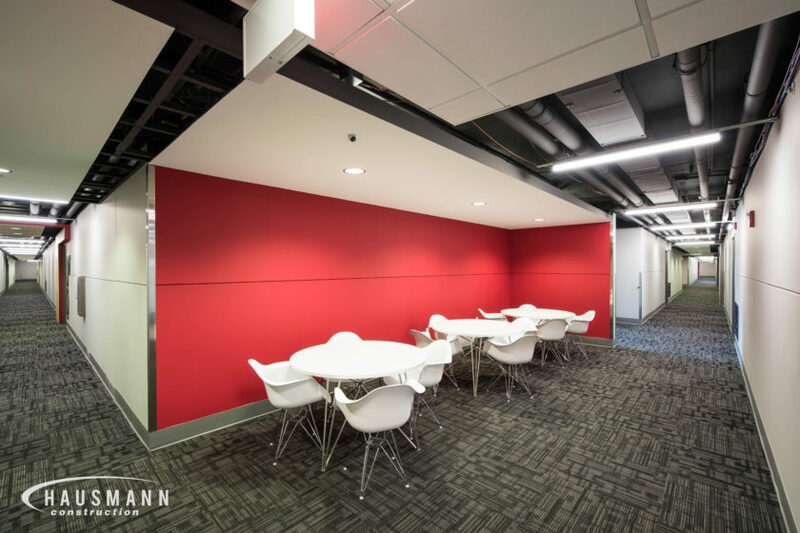 The structure incorporates a double threaded helix circulation in a three-bay design, with two sloping ramps and one flat bay. 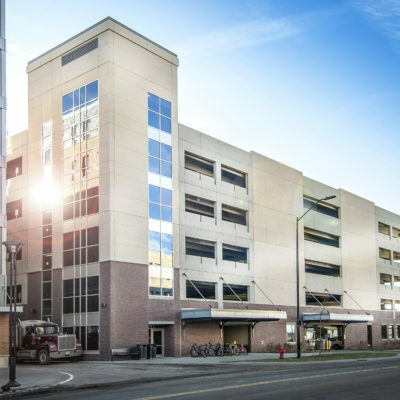 Vehicular access from the first level approaches off of Q and R streets. 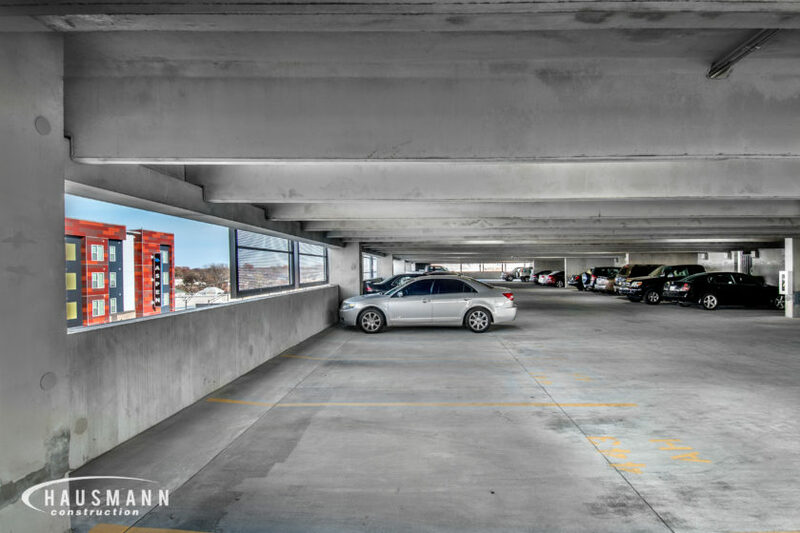 There are five full and a partial sixth-floor of parking with 90-degree stalls and two-way traffic. 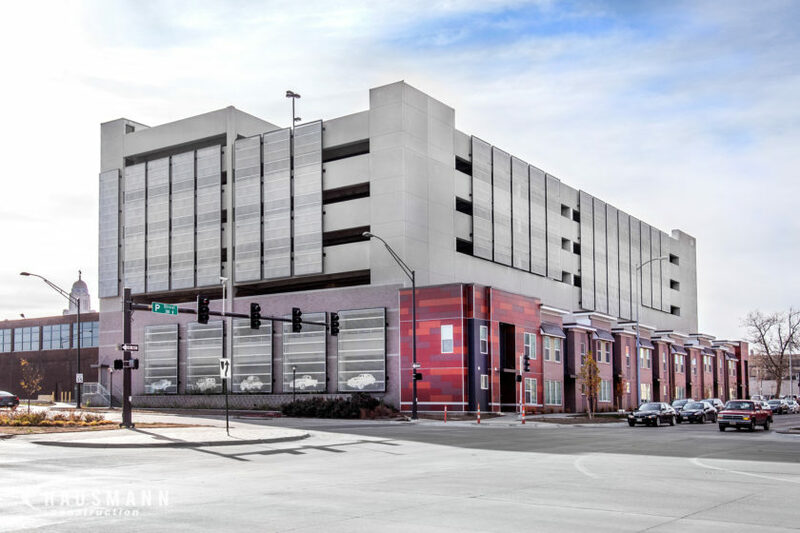 The first level north end includes space for parking office, storage, trash holding and mechanical equipment. Stair/elevator towers are provided in the southeast and northeast corners of the structure with sidewalk level connections to Q and R streets. 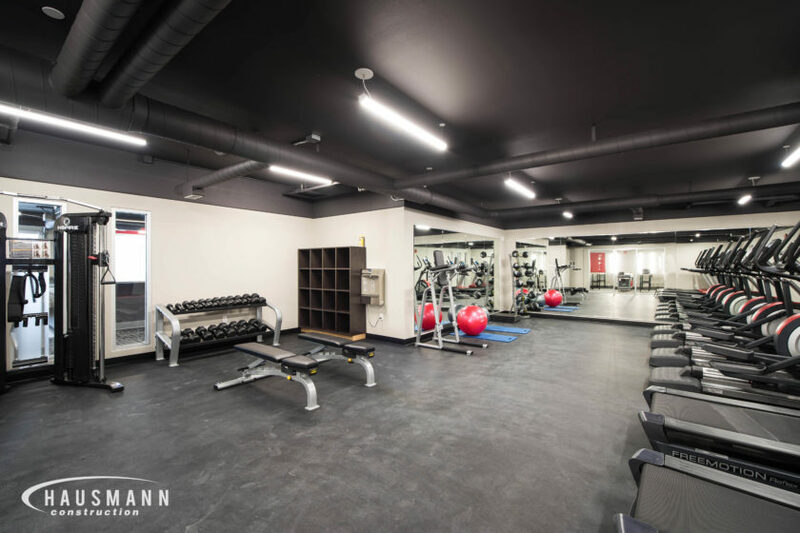 Typical floor to floor height is 11’4”. 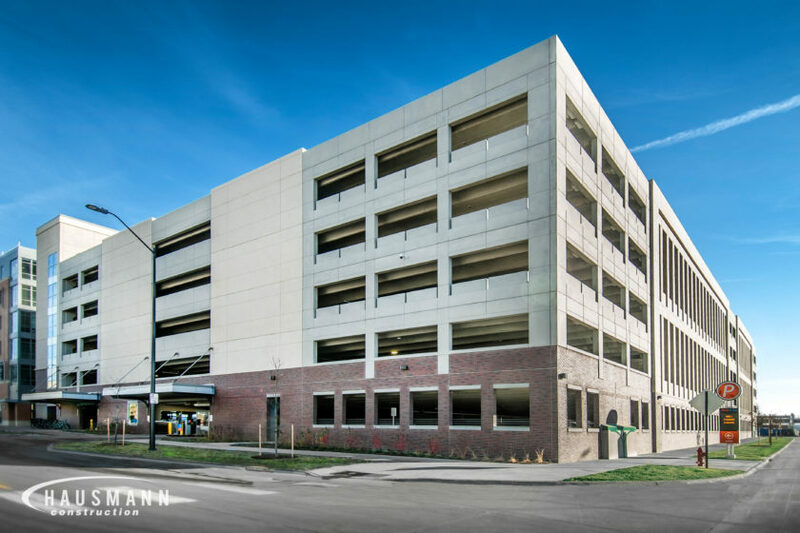 The overall stall count is 947, of which 19 stalls are provided for ADA parking requirements.